As a Create customer, you can work together with an external developer to use our API. Using the API, you can speed up many everyday tasks associated with running your site and shop by developing integrations with third-party software - or 'Apps'. Where is the API area located in my Create account? 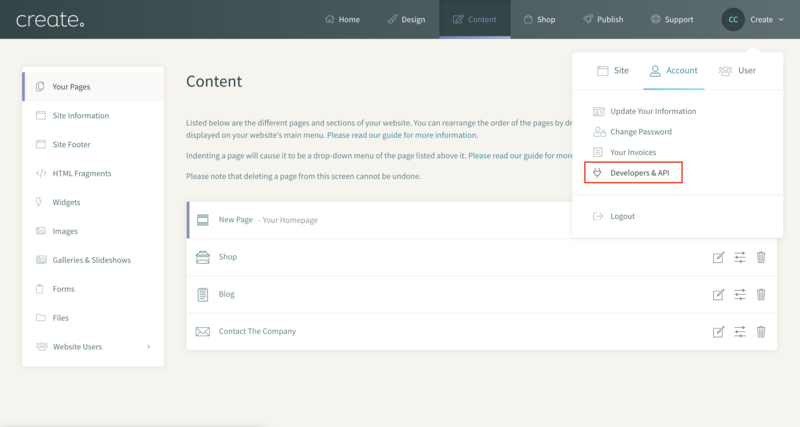 You can access the API area within the 'Account' section of your Create account. You'll then see the 'Developers & API' section. How do I integrate Create with a third party application? If you'd like to take advantage of the API, you will need to have a strong understanding of APIs and coding in general or work with a developer who does. If you'll be coding the integration yourself, please see our API help guide and API documentation. Partnering with a developer means that they can wrangle all of the code necessary to streamline these processes. From within your account, you'll simply need to provide them with your Auth Token which could be found in your account. Once the integration is set up by the developer, you're good to go.